Reduce Your Workload and Grow Your practice at the same time. Advance your social media effort with a proven strategy that helps you expand your reach and attract more of the type of clients you want. How to market your advisory firm using your social media accounts in a whole new way. Stop dabbling for 15 minutes a day with no direction! How to launch compelling social media content campaigns that run all year long to inspire your target audience ...while you work on your business. It's time your marketing worked for you. The right way to repurpose the content you already have to expand your reach and impact. Fill in the blanks of the specific examples included! Enter your name and email to access your free Guide. Your privacy is safe with us! We don't rent or sell your information. 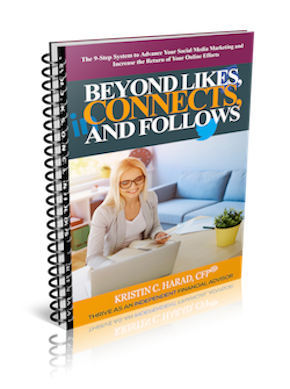 I reveal the exact same 9-step system that I use for my business that helps me expand my reach and attract clients exponentially fast! Simply follow the step-by-step instructions in the guide to advance your social media efforts and gain more traction. © Copyright 2016-2017. Broderick Street Partners, LLC. All rights reserved. Terms & Privacy. As with any endeavor, you are responsible for understanding your audience, testing and learning, and seeing what resonates with your clientele. This is not magic!